With the long-awaited roll out of our fully responsive, HTML 5 site redesign exactly one week ago today, LFG users jumped at the opportunity to do something to their profile page that few, if any, other online dating sites offer: personalized profile page cover photos. When they logged in however, they weren’t just treated with a generic, blank photo as their base plate; rather, they encountered the beautiful morning sunrise you see here. While some may recognize the still-sleeping city, you probably don’t know the full story behind our default cover photo – that, my friends, can be read below. What’s that old saying? A picture is worth a thousand words? Well, this one to Casey and I, the co-founders here at LFG, is most definitely worth more than a thousand words, but I’m not here to bore you with a lengthy novel. Let’s get straight to the story, so you can head back over to LFG and tell your own story with your brand new profile cover photo. 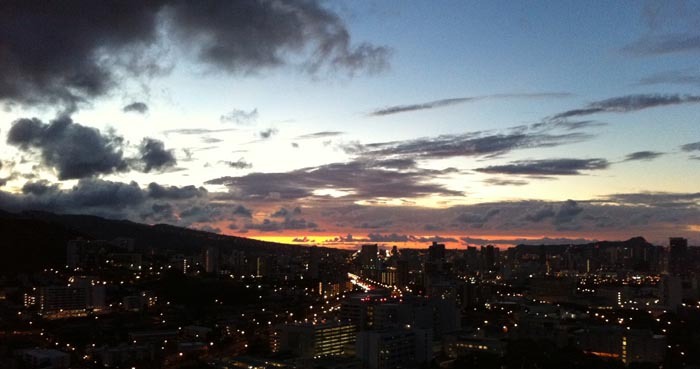 If you haven’t figured it out yet based on some key terrain landmarks, this early morning sunrise photo overlooks the city of Honolulu, and to the far right the iconic tourism hot spot otherwise known as Waikiki. So what in the world does Honolulu have anything to do with LFGdating? Great question, and a very fair one – everything. If you haven’t read our Founder’s Story yet (can you tell we take pride here at LFG in being transparent with our users? ), then you should; but regardless, I was stationed out in Hawaii for the better part of LFGdating’s pre-launch build. Essentially, LFGdating went from pure great idea to concept once I first arrived out there, and then went into actual development while I deployed overseas. This photo, believe it or not, was taken by me just a few days after coming home from that deployment, and while I don’t want to get too cheesy here, it does signify quite a bit. LFGdating, for both Casey and I, has been an incredible amount of hard work. I don’t think either of us could count the number of way too early mornings in which we woke up to do conference calls, web development, etc, and this photo, was a break from doing just that. When you’re in the Marine Corps, you don’t have too many opportunities to work on your side business during the day, so we built our dream in the early mornings and late nights that we had; now, as the site continues to explode, we couldn’t be prouder of what we’ve accomplished. And for that, we want to say thank you to all our current LFG users, from beta to this morning’s new batch, and everyone who may be reading this for the first time who have yet to sign-up. We sincerely hope you enjoy the new responsive site design at LFGdating, and if you haven’t told your own story yet, then get started with a cover photo today! Thanks again for raising your LFG flag, and have a great weekend!